Sitting members of Congress rarely become President of United States. The last Congressman elected President while serving in the House was James Garfield in 1880. Many House members have vied for the White House since then and have failed. Shirley Chisholm (D-NY) was one of those members of Congress who tried and failed. 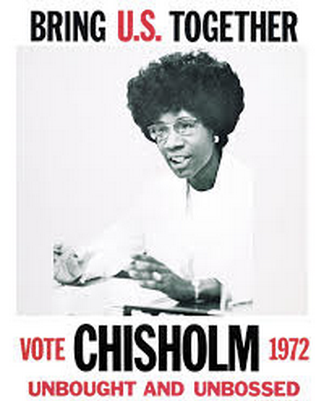 In 1968, Chisholm was the first African-American Congresswoman elected to office. In 1972, she was the first African-American in a major party to run for President. She lost the Democratic nomination to Senator George McGovern. The poster shown here is from her 1972 campaign. What message is Congresswoman Chisholm trying to convey here? Short and to the Point? Perhaps Senator George McGovern‘s team felt that a :60 ad highlighting the lowlights of the Nixon Administration would resonate with the public in 1972. Maybe this ad is a little too long. Could it have been done better in 30 seconds? When the Presidential Election of 1972 was all said and done, President Richard Nixon (R) soundly defeated his Democratic opponent in a landslide. McGovern went on to win only one state, Massachusetts, and the District of Columbia. Here is something that you don’t see in politics too often. Two politicians from two different political parties who agree on an issue. In this video, you have former US Senator George McGovern (D) and former House member Jack Kemp (R) talking about lawsuit abuse in a :30 advertisement. Both gentlemen have since passed, but the mention of their names in political and non-political circles commands a certain level of respect. Today’s political atmosphere is filled with cynicism and partisanship. Partisanship is simply the act of only listening to one side of an argument and then taking that side consistenly throughout any form of discourse. Politicians seem to vote on party lines so often that they wouldn’t even dare to vote for a bill or on idea brought forth by the opposition. Bipartisanship means that you will work with the other side to get things accomplished. What issue do you believe that both parties should be able to agree upon? There are 538 available Electoral College votes in this year’s Presidential election. That total has remained the same since 1964. Below are the Electoral vote totals for each Presidential election since 1964. What do you think this year’s Electoral vote total will be for the 2012 Presidential Election?